One of the most frequent complaints about institutional adoption of crypto-currencies is that holding the virtual currency in some server (or exchange) half way around the world tends to be a very risky proposition, following almost weekly reports of some exchange being hacked with funds getting syphoned out by skillful hackers. That may change soon because as Bloomberg reports, Goldman Sachs - which last year emerged as one of the staunchest backer of bitcoin - could start offering custody services for crypto funds, providing a boost for the growing universe of funds betting on cryptocurrencies. Goldman vouching for crypto custody - the equivalent of insurance on the underlying asset - would mean that the bank would hold the securities on behalf of the funds, effectively eliminating the risk for clients worried about the threat of losing their investments to hackers of rogue attacks. Should Goldman - which was among the first Wall Street firms to clear Bitcoin futures - officially launch such as service it would provide "a credible backing for crypto funds and could pave the way for more investors to bet on the asset class." More interesting is Bloomberg's observation that having a custody operation in place could also lead to other ventures, including prime-brokerage services, which suggests that hedge funds would not only be able to bypass the USD as a currency of exchange, but that Goldman would also accept cryptos as collateral, which could then be subsequently levered. "In response to client interest in various digital products we are exploring how best to serve them in this space," a spokesman for Goldman Sachs said. "At this point we have not reached a conclusion on the scope of our digital asset offering." Goldman won't be the first to enter the space of cryptocustody: in May, Nomura joined other bank to create a custody consortium called Komainu. Meanwhile, Bloomberg notes that at least three giant Wall Street custodians - Bank of New York Mellon Corp., JPMorgan Chase, yes even Jamie Dimon's bank, and Northern Trust - are concurrently "working on cryptocustody services or exploring it." While Goldman may be first in this venture on US soil, the bank has been cautious around cryptocurrencies and despite reports it was in the process of expanding its in house trading capabilities, it has yet to finalize setting up a full-fledged desk to trade the currencies since hiring Justin Schmidt, 38, earlier this year as head of its digital-asset markets. 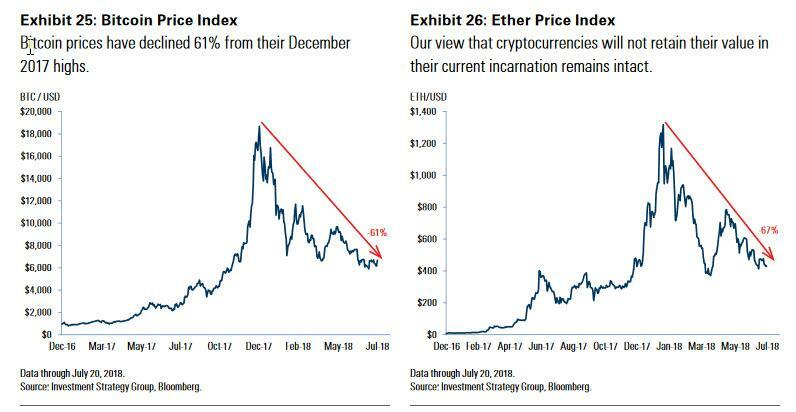 Curiously, yesterday we noted that even as Goldman remains optimistic on the financial services that can be provided in the context of crypto, it is turning more bearish on crypto's upside potential. In its 2018 Market Outlook, the bank highlighted "cryptocurrency mania" as one of several factors that could affect the bank's initial market outlook for this year. Of course, it is by now common knowledge that when Goldman tells its clients to do one thing, its own prop desk is usually doing the opposite, which begs the question if the recent sharp drop in crypto prices is just an opportunity for Goldman's traders to accumulate ahead of the bank launching a highly profitable suite of services targeting crypto funds just as the next leg higher in the various cryptos kicks in amid growing institutional adoption, and draws even more buyers in. Finally, recall what one of the big bullish catalysts for crypto was in late 2017: the lack of volatility in other asset classes. Well, in the aftermath of February's VIXplosion, bitcoin lost its crown as the world's most volatile asset. However, with VIX now normalizing and once again approaching single digits, traders may soon have no choice but to dip their toes in the crypto water if they hope to make any profits by daytrading.